Why I think the market is going lower before going higher. I’m not trying to predict the market; but this is what I see and think is going to happen. I’m just simply analyzing something that I’ve observed. Before I go on, let me explain some basics. Bond prices and equities prices move in opposite directions; the prices have negative correlation. Bonds are considered to be risk free while equities are risky. When risk comes off, the bond market rallies; when the risk goes on, the equity market rallies. It’s simple as that. Now let’s look at TMF, Direxion Daily 30 Year Treasure Bull 3x shares. Why TMF? Because it has shown some clear negative correlation to the SPY, S&P500 SPDRs. The chart below tells it all. The yellow line is the SPY and the green-red colored is TMF. While SPY has been hitting resistance at around 110 with the doji which indicates indecision on whether to go up or down, the TMF has been rallying. What this tells me is that there is conceivable risk still lingering in the markets or in the majority of investors’ minds. Also, the equity market has shown tremendous strengh in the last 7 days or so: We’ve come up way to fast. Although the equity market had some consolidation until late afternoon, we might have to make a higher low at the short term trend to break out of the down trend that we’ve seen since May. TMF chart gives us an insight as to how much. 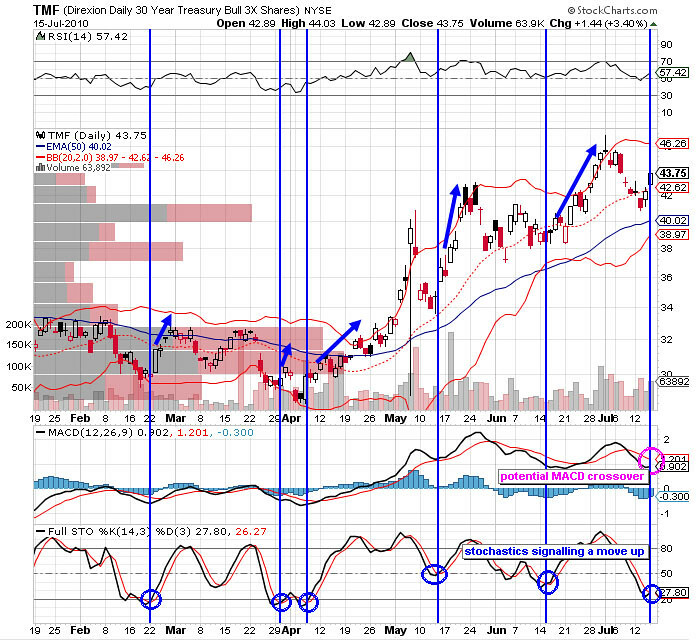 The slow stochastics is signaling that TMF has about to begin another rally. Also, the MCAD is about to signal a buy on TMF. So what’s the strategy here? Short the SPY for a week or so. I’m already short HRL; because most indicators line up as I’ve discussed in my previous post, “1-Week Trade: Short HRL!“. My short term long positions that began 6 trading days ago will honor the trailing stops that I’ve setup. My really long positions with a trading window of 8 months that I have nibbled every week or so since the “black swan” event in very small amounts will remain as is such as GS, PKG, KR, QCOM, and DIS.